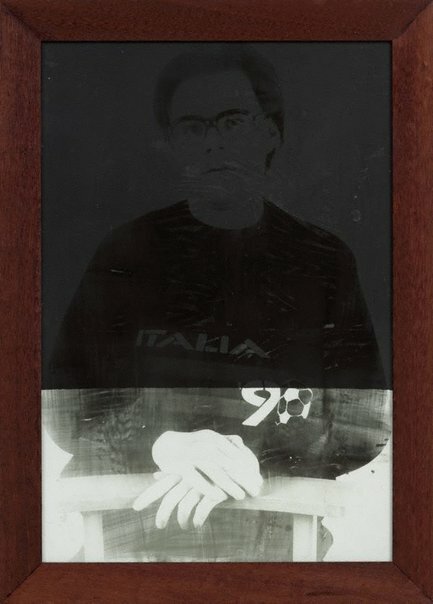 Rrap has exhibited widely in Australia and in 2007 had a solo survey show at the Museum of Contemporary Art, Sydney, an exhibition accompanied by a substantial monograph by Victoria Lynn. This exhibition traces a trajectory through her practice in which sculpture, photography and video unite to take apart any traditional notion of self portraiture and replace it with a much more insightful analysis of the relationship between our body and sense of self. image resonates with both the mystery and over familiarity of the original, and yet something of its aura survives this process and helps to make these compelling portraits. Signed and dated l.r. verso on frame, black fibre-tipped pen "J(illeg. )R '91".